How do I buy a Lenny's Grill & Subs Franchise? Lenny’s Subs is the Best Place to Eat, Work and Own! The Lenny's concept is simple - take a wholesome environment and add employees with great personalities. Combine this and our fantastic food with the subtle touches we've added to ensure better guest experiences (larger tables, bigger booths, no trashcans and hand-delivered beverage refills), and you'll see the Lenny's Magic. We've created an improved dining experience that distinguishes us in the sub-sandwich industry and promotes brand loyalty. The first Lenny's Subs opened in 1998 in a suburb of Memphis, TN, to satisfy cravings for authentic deli subs and Philly Cheesesteaks; and though Lenny's Subs was originally planned as a single unit restaurant, the tremendous reception from guests at the first location prompted rapid growth and the concept soon became franchised. Open Lenny's Grill & Subs in any of these available states: AL, AR, FL, GA, KY, LA, MI, MS, NE, NC, OK, TN, TX. Is LENNYS Grill & Subs a Great Fit for You? 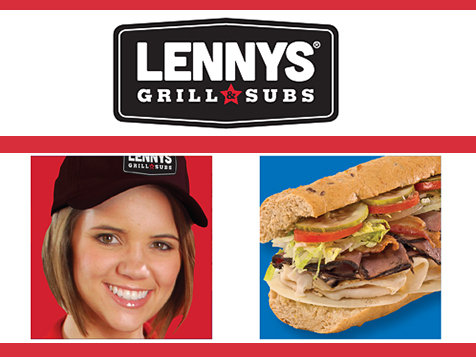 LENNYS Grill & Subs is seeking well-capitalized, experienced business professionals to join our franchise team. Restaurant experience is highly preferred. 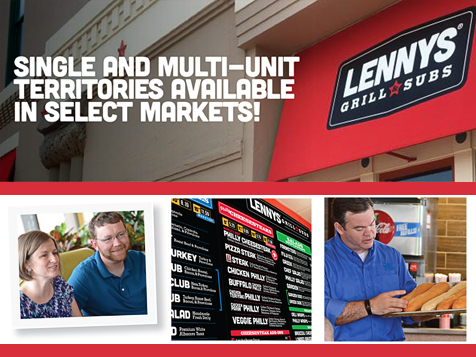 LENNYS Grill & Subs is offering territories for multi-unit development to qualified candidates. Review the four points below to decide if Lenny’s Grill and Subs is the right fit for you! #1) LENNYS Grill & Subs produces top quality food products! Do you have a passion for serving the best? The core of the LENNYS offeris our great food! Everything else we do rests on this premise that “Everybody Deserves Great Food!” Our great sandwich lineup begins with craft breads which are fresh baked in each store every day! Our deli subs are made with top quality meats which are freshly sliced when ordered. LENNYS Philly Cheesesteaks are truly “World Class” and are superstars in the markets where we operate. Our additional Grilled sandwich offering includes favorites like the original meatball and hot Italian! Our quality offering includes a strong lineup of salads made with fresh spring greens and a choice of wraps for any deli sub or Philly Cheesesteak. It takes a little more care and effort from all of us to serve the best but we continue to be committed to doing it right every time! #2) The LENNYS Grill & Subs team has a clear focus on our guest! Do you have a passion to serve guests and to put their interest first? At LENNYS every member of the team knows that when we focus all of our efforts to serve our guest we all will win. Whether we are working on the great food products, our store operating procedures, store layout and design, or our branding and marketing, our core guest is always at the center of our decision making. Our culture is to be in the service of our guest in everything we do. Our goal is that “Every Guest Leaves Completely Satisfied”. Driving increasing guest satisfaction with our offer increases our base of loyal guests and the frequency with which they visit us and is the key to our long term success! #3) The LENNYS Grill & Subs strong business model is always improving. Do you have a passion for continuous improvement? Since 1998 LENNYS has been improving the business model for our restaurants and our dedicated work on that continues. Our business model begins with our menu items, the quality products we source, and our build process for each of those items. At LENNYS we work to keep our processes as simple and clearly articulated as possible to improve our excellence in execution. Our range of sandwich sizes gives us a unique opportunity to position our guest to the size that really fits them want while giving us the opportunity to value price along that spectrum. #4) LENNYS Grill & Subs offers an excellent franchisee training and support package. Are you looking for a proven operating system? LENNYS believes in nothing less than the best when it comes to training and supporting franchisees. In-depth training is provided to all new franchisees. LENNYS franchisees are also provided with access to the L.E.A.R.N. program (LENNYS Education And Resource Network) - an all-inclusive web-based learning tool accessible to franchisees and employees from the restaurant or at home. Once a new LENNYS franchise restaurant is ready to open, operations coaches and advisors will arrive at the restaurant for support. Operations advisors visit each operating restaurant at least every 60 days to ensure brand standards and be sure the franchisee has all the tools they need for success. Lenny’s Grill & Subs is currently accepting inquiries for new locations the following states: Alabama, Arkansas, Florida, Georgia, Kentucky, Louisiana, Michigan, Mississippi, Nebraska, North Carolina, Oklahoma, Tennessee, Texas. Interested parties should have a minimum of $70,000 in liquid capital to invest. Lenny's Grill & Subs is not currently active in our directory, but here are some other recommended selections for you to explore.